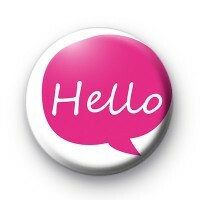 This 25mm badge has a bright pink speech bubble with HELLO written in white font. Its a pretty simple badge with a positive greeting, we like to say its short but sweet. All our button badges are handmade in our UK workshop.